1.Preheat oven to 400°. In blender, blend wine and 1/2 cup pomegranate seeds; strain through fine-mesh strainer into small bowl and discard pulp. 2.In small saucepan, heat shallot, honey and pomegranate-wine mixture to a boil over high heat; reduce heat to medium and simmer 8 minutes or until reduced by 1/2. Remove from heat; stir in butter. Makes about 1/2 cup. 3.Place salmon, skin side down, in 8-inch square baking dish; sprinkle with salt and pepper. Pour wine mixture over salmon. Roast salmon 15 minutes or until internal temperature reaches 145°. 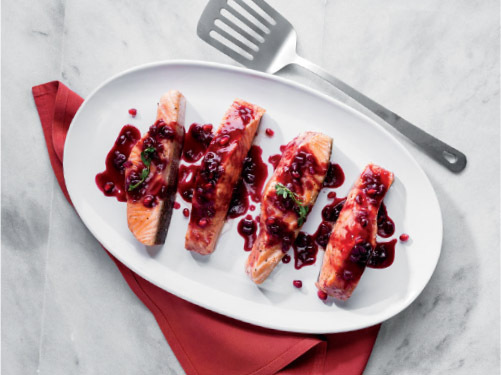 Serve salmon drizzled with pomegranate-wine sauce and sprinkled with remaining 1/4 cup pomegranate seeds. Garnish with thyme sprigs, if desired. Red wine is known for the beneficial effects of resveratrol on heart health. Pomegranates have 3x as many antioxidants as red wine.Combined with omega-3 rich salmon, this recipe offers a 1-2-3 knockout punch to protect your heart!